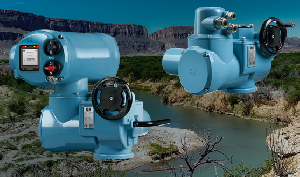 The Rotork CK range of modular electric valve actuators have replaced obsolete actuators to provide a reliable and economical upgrade on irrigation gate valves on the Rio Grande River in New Mexico. In a project for the United States Bureau of Reclamation, the actuators have been retrofitted on the Mesilla Dam in the Elephant Butte Irrigation District at La Cruces, NM. The CK actuators control and regulate the water level to provide irrigation control. The modular CK design enabled rapid and simple installation and commissioning using the existing power and 4–20 mA feedback and control connections at the 14 valve locations. CK actuators are fully supported by the Rotork worldwide network of offices and representatives, in this case provided by Rotork local representative ProTech Group.